Too many yeast in the intestines (yeast overgrowth) is a common problem that occurs in those with chronic Lyme disease either during treatment or prior to beginning treatment. Yeast overgrowth can result in an ongoing systemic allergic reaction to the yeast that can suppress the immune system. It may also lead to inflammatory cytokine and oxidizing agent excess that lead to many of the Lyme disease symptoms and pain. Food allergies and sensitivities can be the result of yeast overgrowth too. 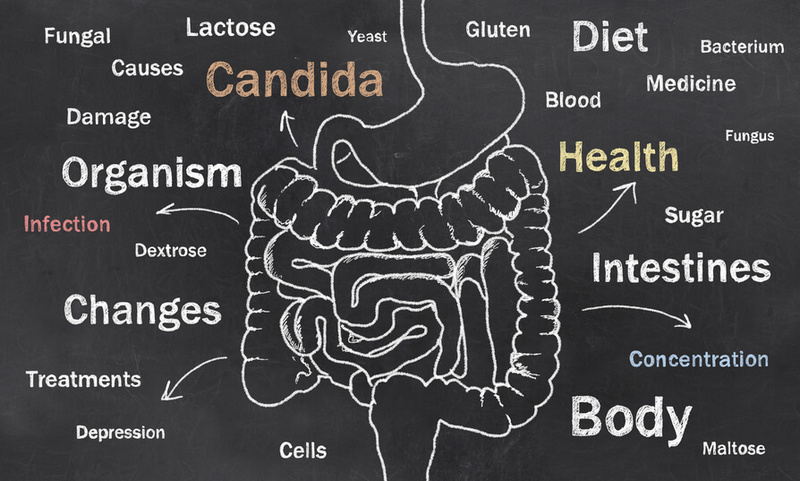 Healthy functioning intestines are populated with a balance of good bacteria and yeast. The yeast and bacteria compete with each other for intestinal territory. Good bacteria decline due to the use of antibiotics, environmental stresses, immune suppression from chronic illness, the use of steroids, and/or other factors. When this happens, yeast can grow too much. The immune system sees the yeast and reacts by releasing histamines into the blood stream. Histamines are what give most of the symptoms that occur in allergies. Yeast overgrowth can also lead to leaky gut syndrome. In this, the yeast cause the cells lining the intestines to pull apart creating gaps. Toxins, incomplete digested food particles, and other chemicals can then leak through these gaps into the blood stream. Before reaching the blood stream, they react with white blood cells triggering allergic reactions and inflammation. This is a Lyme Byte from Conversations with Marty Ross MD on 5/14/2013 when Dr. Ross practiced in Seattle, Washington. To prevent Candida yeast overgrowth in the intestines and to keep a balance of good intestinal bacteria, probiotics may be helpful. Herbal and prescription antibiotics can kill healthy intestinal bacteria which can lead to yeast overgrowth, immune system imbalance, and poor digestion with loose stools..
Use either a soil-based probiotic with Bacillus species or human intestinal bacteria with Lactobacillus and Bifidobacterium. For greater intestine dysfunction, consider using both types. The advantage of a soil-based spore-forming probiotic is that it does not require refrigeration. Be sure to use brands which use strains that are scientifically proven effective. For more information about these different probiotic types and products see Probiotics in Lyme Treatment. Herbal Anti-Yeast Combination. Take 2 capsules 2 times a day. Prescription Medication. Nystatin 500,000IU 2 pills 2 times a day.